A trade show is one of the best opportunities your business will have to get its products in front of the eyes of important industry leaders. Unfortunately, trade shows also require a big investment. From the amount of time you’ll put into planning to the product that you’ll need to set aside for the event, you’ll have a lot on the line at a trade show. That’s why you’ll want to be sure to make the most of it and in today’s blog, the experts at AFP Global Logistics are here to share some of the tips for tradeshow success that we’ve learned during our 25 years in business. Trade show planning requires the help of logistics experts. This may seem like it goes without saying, but you need to guarantee that you will be able to reach the event on time with everything you need on hand to make the event a success. That means that you’ll need to ensure that your trade show logistics are handled with care and expertise. 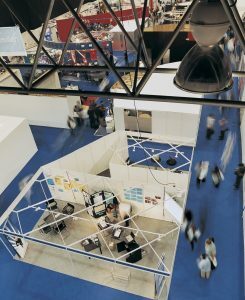 Outsourcing your logistics to a company that is experienced with trade shows can help ensure that you will be able to make the most of your exhibit. Trade show exhibit halls are filled with other vendors who are vying for attention from the same people that you will be trying to attract. That’s why you need to make sure that your booth is noticeable and brings people in. Make sure your exhibit stands out and don’t forget to offer some freebies to help entice people to visit your booth. Trade shows are the ideal venue to network with others in your industry. When deciding which staff members should staff your booth, be sure to choose employees who are sociable and comfortable approaching strangers. And don’t forget to bring plenty of up-to-date business cards! When you need an experienced trade show logistics provider, AFP Expo is the best and only choice! We provide a full range of customizable logistics services, and our 25 years in the business have given us the tools we need to tailor our logistic solutions to each and every individual customer. For more information or to start designing your own logistic solutions today, get in touch with AFP at 410.590.1234 (toll-free 800.274.1237), email us at info@afplus.com, or fill out our quick and easy contact form here! This entry was posted on Thursday, June 2nd, 2016	at 3:34 pm	and is filed under AFP Expo	. You can follow any responses to this entry through the RSS 2.0	feed. Both comments and pings are currently closed.